Deerfield Apartments offers 1 & 2 bedroom apartments. Please select a unit that you like, fill out your name, number, and email, and you will be redirected to our quick and convenient online application. Not seeing what you're looking for? Availability changes every day, if you tell us what your needs are we’ll call you when availability changes. All room dimensions are approximate and may vary by apartment. When you make your home at Deerfield Apartments, you can relax in style. 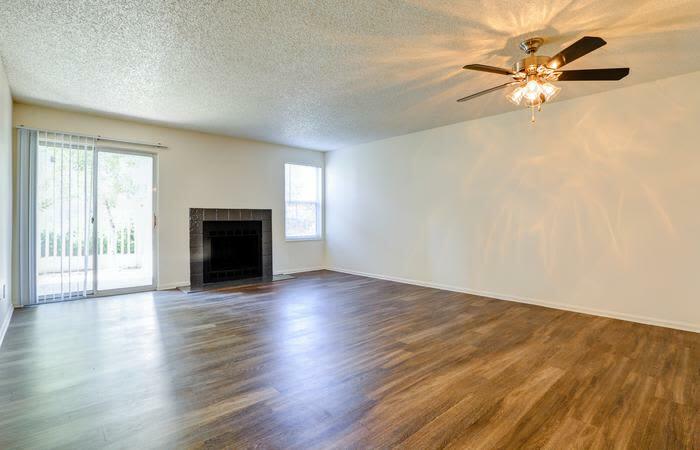 Our SE Denver, Colorado, apartments for rent boast spacious open-concept floor plans and recent renovations. Our affordable living spaces feature chef-quality kitchens with high-end electrical appliances, updated cabinetry, and generous storage space. Each of our apartment homes offers a cozy in-home fireplace where you can warm up on a cold Colorado night. You will have room to grow at Deerfield Apartments. We offer one and two bedroom apartments for rent in Denver, CO, near Aurora. With four unique floor plans ranging from 718 sq. ft. to 1,186 sq. ft., you will have plenty of space for your life, your pet, your furniture, and your gear. Our apartment homes feature an in-home washer and dryer and ample closet space so it’s never been easier to keep your clothes clean and your living space tidy. Our apartments even offer a private balcony or patio, a peaceful outdoor space where you can unwind with a pint of your favorite Colorado craft beer. Four Spacious Floor Plans Ranging From 718 sq. ft. – 1,186 sq. ft. Choose your new living space. Call Deerfield Apartments today to schedule your personalized tour of our Denver, Colorado, apartments for rent.